Our volunteer tutors provide useful and informed feedback on English for Academic Purposes (EAP) students’ writing at different stages of the writing process. 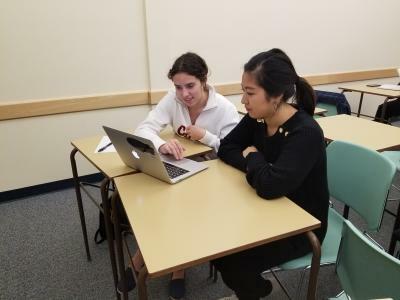 Tutors help EAP students get started, find appropriate sources, brainstorm ideas, create outlines, work on thesis statements, structure & organize texts, maintain coherence & cohesion, and self-assess produced texts. The goal of WTP is to help EAP students improve their academic writing skills by providing them with writing tutorial support. EAP students are considered English additional language learners “whose primary language(s) or language(s) of the home, is other than English and who may therefore require additional services in order to develop their individual potential …. Some students speak variations of English that differ significantly from the English used in the broader Canadian society” (Ministry of Education, 1999). WTP runs on a one-on-one session basis in which an EAP student works with a tutor on a certain area of writing. Each session takes up to 1 hour in length. EAP students bring a copy of the assignment instructions, notes, outlines, or drafts they have already created to work on with their tutors. Both EAP students and their tutors set goals and strive to achieve them. Tutors do not write, proofread, or edit EAP students’ writing. Rather, they provide higher order thinking feedback on their writing such as feedback on introductory, body, and conclusion paragraphs, strong thesis statements, relevant supporting points & details, unity, organization, coherence & cohesion, and language usage. If you are interested in contributing to WTP as a tutor, please apply here. If you are an EAP student and are interested in having a tutor, please apply here. If you have any questions, feel free to email Dr. Mohammed Almazloum @ mohammed.almazloum@uleth.ca or drop by the International Centre office SU060.